It seems silly to stand on your back deck taking pictures of yourself, but there you go. We live in crazy times. I think slow fashion is a great mindset to cultivate so I thought I would chime in as I get so much inspiration throughout the year from all the talented makers out there on the internet. I'm a tall active person, I need clothes that can really support all that I do in a day. I stopped looking at much retail fashion because very little of it really fits me properly and as a tall person there is nothing worse than wearing something that makes you feel like the Hulk. So I am cobbling together my own look and through the process learning a lot about my body and what makes it look and feel good. Clothing should be comfortable but it can also be inspiring. I feel protected in my clothes and I also feel powerful. When I get this outfit on, on a crisp fall morning I feel ready to face the day. This outfit is a mixture of me-made, custom made, and inherited. 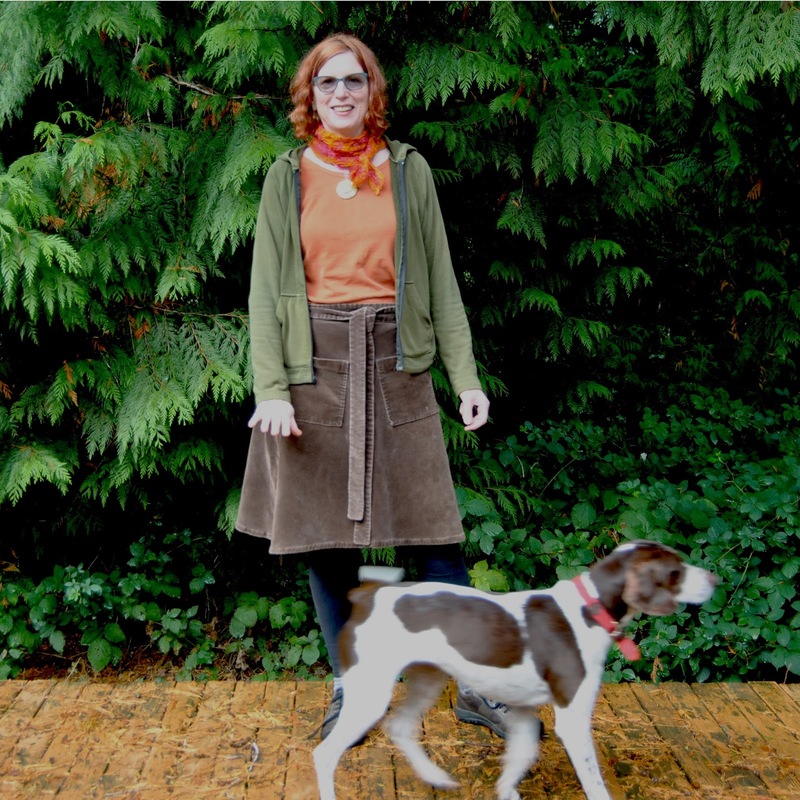 This corduroy Miette Skirt with me-made tights wants you to take it for a walk. When I was a kid I never had tights that were long enough, it was a humiliation. Sewing my own leggings is practically a healing act. The hoodie and top both in Hemp are by Intertwined Designs customized for me. There are quite a few options for custom made stuff these days and whether you are supporting a small local business or a custom shop overseas, rest assured these pieces are going to be long lasting. I knitted the kerchief scarf using Spincycle Yarns and my own whacky no pattern approach to things. The jade necklace was a gift from my lovely mother in law. My shoes were previously owned by my brother in law who died in late February. I walk in these shoes most days and I think a bit about him when I lace them up. Walking is an essential daily activity. Some people pray, I walk. The dog is a volunteer. The best kind.